Yesterday, BlackBerry launched the new Classic smartphone at an event in New York City. This morning, the company has now hosted its launch event in Singapore and officially announced the Classic will be available through all major Singapore operators. This QWERTY-packing device brings back many of the main aspects die-hard BlackBerry fans love. Check out the press release below for more! BlackBerry today launched the BlackBerry® Classic™ in Singapore. The no-nonsense smartphone built to meet the needs of productive people who appreciate the speed and accuracy that can be found with a physical QWERTY keyboard is available island-wide through each of the three major network operators, M1, SingTel and StarHub. 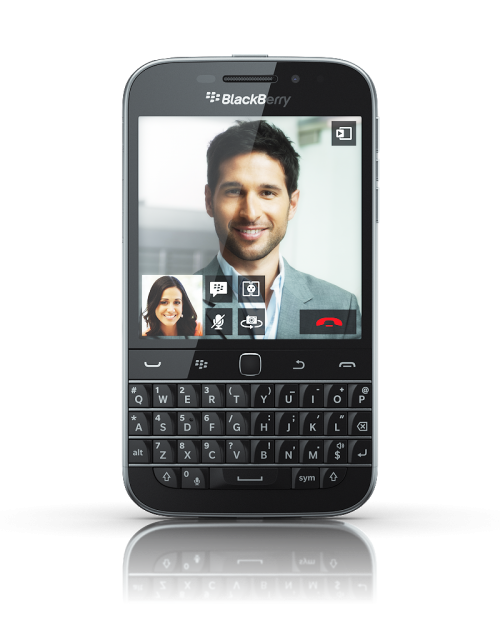 – BlackBerry® Keyboard & Trackpad – The QWERTY keyboard has stood the test of time as the iconic BlackBerry feature that users know and trust. Crafted for optimal speed and accuracy, the BlackBerry Classic’s QWERTY keyboard gives users the control and confidence to communicate quickly and clearly using one hand with a trackpad and classic navigation keys. – BlackBerry® Browser – The BlackBerry 10 web browser is amazingly fast and astoundingly beautiful. That’s why HTML5TEST.com rates it amongst the top mobile browsers for web fidelity. (i) Access your favorite online content as it was meant to be seen, faster than ever before and with unlimited browser tabs. – Premium Components – The device is built with durable materials mixed with top-of-the-line technology. This includes a 1.5 GHz Qualcomm Snapdragon Processor, 2GB RAM, 16GB of device storage (expandable by up to 128GB via uSD), and a 2MP front- and 8MP rear-facing camera with enhanced optics and upgraded imaging sensors. – BlackBerry® Blend – BlackBerry Blend brings messaging and content that is on your BlackBerry smartphone to your computer and tablet. Get instant message notifications, read and respond to your work and personal email, BBM™ and text messages, and access your documents, calendar, contacts and media in real time on whatever device you are on, powered by your BlackBerry. – BlackBerry® Assistant – The BlackBerry Assistant is BlackBerry’s first digital assistant and can be used with voice and text commands to help users manage work and personal email, contacts, calendar and other native BlackBerry 10 applications. It’s the only smartphone assistant on the market today that can access both personal and work content in your work perimeter. BlackBerry Assistant intelligently determines how to respond to you based on how you interact with it – if you type, it responds silently, if you speak, it speaks back and if you activate over Bluetooth, it speaks back with additional context because it assumes you might not have access to the screen. – BlackBerry World – BlackBerry World showcases essential productivity apps for business professionals looking to drive efficient communications and collaboration. – Amazon Appstore – Preloaded on BlackBerry Classic, users can access popular Android apps and games through the Amazon Appstore including Candy Crush Saga, Pinterest, Kindle for Android and Cut the Rope 2. Users can also scan Android apps for malware and privacy issues prior to installation using BlackBerry Guardian. – BlackBerry® Hub – The one place to manage all your conversations – email, texts, BBM, phone calls, social media and more. You can even glance at what’s next in your calendar. It’s always available with a single swipe to help you stay organized, in control and on top of all your conversations. BlackBerry Classic is built on BlackBerry’s renowned secure operating system, with built-in protection against viruses, tampering and data leaks. The BlackBerry Classic is private by default, protecting users with encrypted email, web browsing and BBM. The BlackBerry Classic is now available through each of Singapore’s main network operators and other authorized retail outlets. For more information, please visit www.BlackBerry.com/Classic. Category: BlackBerry 10, Classic, Everyday life, News!